iMovR’s newest addition to the ZipLift family is updated with their signature 3D-laminated wood grain tops. It’s also made in America, which opens it up for bulk buyers that have a mandate to buy American-made whenever possible and for individuals who prefer to buy American in general, whether cars or standing desks. Aside from that, it’s the same ZipLift that we reviewed highly in the past for its stability, ease of adjustment, and ergonomics. One of few available made-in-America standing desk converters. Beautiful and durable 3D-laminated work surface and keyboard tray. Infinite stops and smooth gas strut height adjustment. $150 more than the original, stock ZipLift+, with no standing mat included. iMovR’s latest standing desk converter is one of the best on the market. However, you’ll pay a premium price for American-made quality. That said, it’s still a better deal than any Varidesk, and the product itself is hard to beat regardless of price. Created in response to persistent demand from government, military and many corporate buyers for an American-made option, the Patriot is also sure to find a home with people who prefer the elegance of its 3D-laminated surfaces and those who just prefer to buy American when they can. iMovR’s top-selling sit-stand converter, the ZipLift+, has long been at the top of our list of best standing desk converters for a variety of reasons. There's no assembly required, its easy to use, durable, silent, and features infinite stops plus a tilting keyboard tray so you can find the perfect ergonomic position. Like all the most popular Varidesk alternatives (and including Varidesk) the ZipLift+ is made in China to keep its pricing competitive. 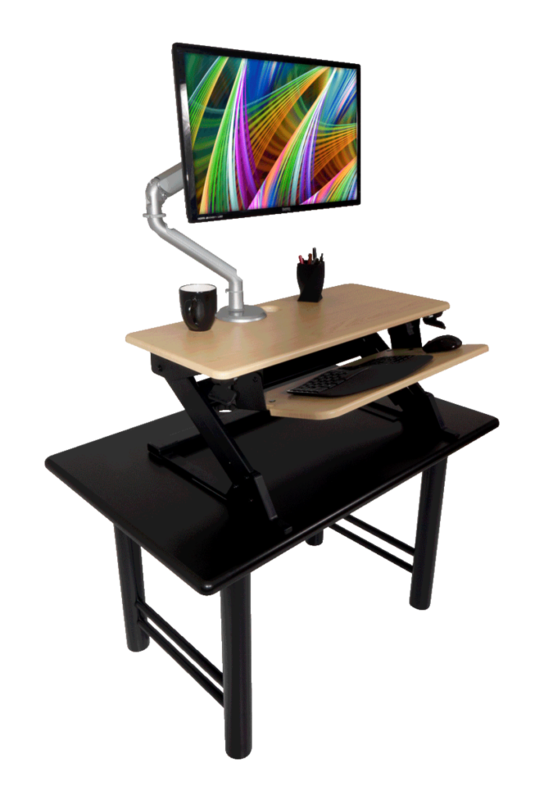 Having made the switch to 100% made-in-USA for their full standing desks back in 2017, iMovR just announced its first made-in-USA desktop converter, the ZipLift Patriot, in response to persistent demand from government, military and even many corporate buyers. Naturally it costs more to make just about anything in the USA versus China, and so there is a $150 price difference between the stock ZipLift+ and the new Patriot ($449 vs. $299). Note that while the ZipLift+ includes a free 18"x24" portable standing mat (also made in China), the ZipLift Patriot is meant to pair with one of iMovR's many different options in it's American-made EcoLast anti-fatigue mats, sold separately. How "Made in America" is it? For a product to be classified as made-in-America according to the Federal Trade Commission's published standards its component costs and manufacturing processes need to be at least 50% domestic; the government recognizes that it's virtually impossible to to make anything these days without some "globally sourced components." The one foreign-made component in the Patriot is its base frame, which is the same as on the stock ZipLift+; the most stable, best made frame we've ever seen on any standing desk converter. There didn't seem to be much opportunity to make that component in the US, but when it comes to the environmentally-sensitive issue of the manufacturing the work surfaces, the Patriot's are all made in Michigan, in the same state-of-the-art plant where iMovR makes their desk and conference table tops. Technically, even some of the most cheaply-made work surfaces are "3D", meaning that they're a "thermofoil" vinyl that can be wrapped around an edge-contoured piece of wood, and sealed under high temperature and pressure. The advantages over standard "HPL" (high pressure lamination) is that the surfaces are not rectangles with sharp edges and corners. Whether just for design appeal or for actual ergonomics, 3D laminated surfaces are nice. Also technically speaking, the surfaces of the ZipLift+ are also 3D-laminated, but there's a world of difference between 3D thermofoiled surfaces made in China and the advanced Surf(x) 3D laminate that iMovR uses on its desks, tables and now the Patriot. The differences start with the quality of MDF (medium density fiberboard) that is used as the substrate, the adhesives and process used to bond the laminate to the substrate, and the quality of the 3D vinyl. The net difference boils down to something that looks mass produced versus a surface that has the look and durability of natural hardwood, but at a fraction of the cost, and with no open seams or exposed MDF (like in the grommet holes). Ergo-contouring: This means that the edges of the Patriot are all smoothed out, so you’ll never encounter any pointy corners as you type, or rest your weight on the edge of the converter. It gives the Patriot an overall polished look and feel—which is something low-end competitors lack. 3D-lamination seals every inch of the work surface, regardless of shape. Easy to clean: The surfaces of the Patriot are easy to wipe down and clean, even with the harsh cleaning chemicals used in the healthcare industry to kill bacteria. 3D lamination means that every inch of the Patriot’s work surfaces are sealed air-tight, including the grommet holes, which also means that harsh cleaning chemicals won't seem into the edge-banding seams you'll find on some desktops and dissolve the adhesives. These surfaces are ready for whatever mess comes your way. Durability: 3D-laminate beats traditional lamination by being twice as scratch resistant and three times as wear resistant as compared to HPL (high-pressure laminate). Because of the tight seal, moisture from the air can't seep in and cause your surface to get bent out of shape. The five year warranty, already industry-leading for a standing desk converter, includes these 3D-laminated desktops. 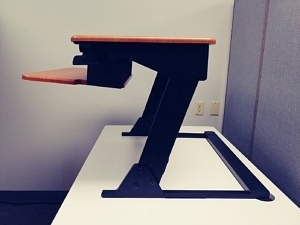 There are a lot of features that make the ZipLift+ a unique product in the standing desk converter market, and we’re glad to see them return on the ZipLift Patriot. Gas strut lift mechanism with infinite stops: Like the ZipLift+, the Patriot adjusts smoothly and silently via a gas strut lift mechanism. There are a few key benefits that pneumatic designs have over spring-loaded designs: because the lift is silent, you don’t have to worry about annoying your office-mates when you go from sitting to standing. It also lets you pick your exact perfect height, unlike spring systems which must rest at set intervals of 1.0" to 1.4" inches per detent, depending on the model. Finally, the ZipLift is just easier to lift even with dual monitors due to a strong counterbalance. Ergonomic tilting keyboard tray: The Patriot features the same tilting keyboard tray that we loved about the original model. A surprisingly rare feature among competitors, the tilting keyboard tray helps to eliminate wrist strain while typing, allowing your hands to reach a more neutral angle. Superior Stability: The ZipLift+ is the most stable converter we’ve ever tested, and the Patriot holds the same honor. Most converters are stable at lower height ranges, but get shaky towards the top. This isn’t the case with the ZipLift series, which allows even users up to 6' 7" tall to type comfortably. The Patriot's tilting keyboard tray on display. What do we wish it had? As of right now the ZipLift Patriot is only available in two colors—light maple and hayward cherry—(over 100 additional colors are available now, but only for bulk corporate orders). In single-order quantities only the 35" version of the ZipLift is being offered for online purchase. For bulk purchases the 42" ZipLift HD version is available, as well as the new ZipLift 42" Corner version. While the Patriot does not include the free standing mat like the stock ZipLift+ the good news is that the American-made Ecolast mats do come in countless sizes, patterns and colors. The ZipLift Patriot makes an already-great product even greater. It took the already successful ZipLift+ and added higher-quality surfaces for both better performance and better looks. For those whose individual leaning or organizational directive is to buy American whenever possible, it's a great addition to the small stable of American-made standing desk converters.